White Cat by Holly Black is like Harry Potter crossed with The Sopranos. In this first book of The Curse Workers series, the American Government has outlawed the practice of magic and everyone wears gloves to protect themselves. The curse workers, whose touch casts a spell, have gone underground to peddle their wares. There are some clever parallels to Prohibition and the rise of organized crime in our world. In White Cat the magical mafia deals in luck, pain, death, love, dreams, physical transformation and erased memories. There is a price to crime: every curse has a blow back on the curse worker. What a fabulous premise! Lacking the ability to cast curses, Cassel is the black sheep of his magical family. His home life is a wreck since his father died and his mother was imprisoned for entrapping a wealthy man with her love spells. His magical brothers are caught up in schemes they won’t share with him. Even worse, Cassel is haunted by the hazy memory of killing his best friend, Lila. At boarding school Cassel tries to carve out a normal life, but disturbing dreams about a white cat haunt him. In his effort to uncover the truth, Cassel is sucked into the magical crime world of New Jersey. I can see this fast-paced, frequently violent story being a big hit with teenaged boys. That’s not to say that teenaged girls and grown ups won’t enjoy White Cat too, but the target audience would be boys aged 14 and up who grew up with Harry Potter and are looking for something edgier. This would also be a great choice for reluctant readers. With all the criminal intrigue, con games and splattered blood, the experience of White Cat was more like gaming than reading, and yet the writing was excellent. This doesn’t sound like a 17-year-old boy who organizes betting pools in his dorm and grew up in a dysfunctional criminal family. Later Cassel notices “hydrangeas” in a vase when meeting a scary crime lord. My 15-year-old son might recognize that word, but only after digging 3 holes for me to plant the flowering bushes in our garden. Cassel’s yard is full of weeds and his house is stuffed with rotting junk. I’m not saying that a boy can’t have a lyrical voice, but we need a source in his character. Black could have made Cassel a bookworm or a closeted poet. Personally, I enjoyed those lyrical passages far more than the graphic descriptions of violence. As faults go, lyrical writing is a good one! Despite the occasional voice disjoint, White Cat is a well crafted page-turner full of intriguing characters and surprising plot twists. I couldn't put this impressive book down. This was my first exposure to the talented Holly Black, and I’m sure it won’t be my last. While working on my NOT CRICKET, with its alternating male-female narration, I’ve been seeking out young adult novels with convincing male voices that still have cross-gender appeal. Please recommend others in the comments if you know of any. I'll be offline most of today getting my son off to 7 weeks canoeing in the wilderness, but I'll be back soon. He's taking The Poacher's Son by Paul Doiron with him. Holly Black explaining the inspiration behind White Cat. Reviewers Disclaimer: I bought this book on its release in May 2010 (June in the UK) without compensation. Thank you authors Kami Garcia and Margaret Stohl for recommending White Cat to me. 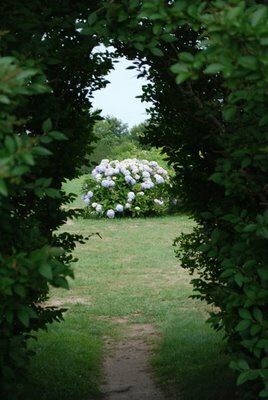 Hydrangeas on Nantucket Island photo by me. Good observations! Is that an element that writers pick up? I know I've become a better reader since I started writing. Shouldn't a good editor have caught that in advance? I hope your son has a fantastic trip! I read your first sentence and thought: 'Could it.. can it... does it... actually work? Harry and Michael Imperioli's Christopher Moltisanti? But according to your great review, it does. I agree with you that sometimes sources are needed to justify a character's articulateness (as is Cassell's case). What I often find, and not so much in young adult fiction, but in proper adult fiction is that the context will provide an explanation for the character's behaviour. I'm re-reading 'Emma' now and I'm finding it a more pleasant read than all those years ago in uni. Mainly because I have discovered the hidden humour that eluded me the first time. And also, because Austen is very good at providing you with characters' main traits without giving away too much. I hope your son has a fab day out. Dear Sarah, I can see that to cross Harry Potter with The Sopranos would certainly give him an edge, or two!! But I then wonder from your review whether I should find the character Cassell totally convincing. "Harry Potter crossed with The Sopranos". That made me giggle. I'm just grateful the character wasn't a vampire. That video interview is fascinating as she explains how she developed this particular world of magic--and that going ungloved is like carrying a weapon. I had read her original fairy books and enjoyed them, especially since she made them edgy. I'm sure I'll check this out, too. It's interesting about the voice issue you bring up. I've noticed in crit group that writers do that--they describe something as they see it, sometimes forgetting that the character doesn't have those eyes and words. The only time I think it works is if the story is told omniscent voice. As for recs, I just read Scott Westerfeld's Leviathan, which has alternating POV between teen boy and girl. Intricate steampunk. Good read. This book sounds really intriguing, but your comment about the hydrangeas was dead-on. I've been reading Monty Don's gardening journal and he has the most wonderfully lyrical voice. I wonder if he had that lyricism and those observational skills in adolescence, though. I really like the book Tangerine. It has an adolescent male narrator and deals very much with male issues/angst . . . but it is a GREAT read for anyone. I read it at 39 and couldn't put it down. Speaking of adolescents, I finally got around to reading Prep -- which I first read about on your blog. SO GOOD. I was going to catch up on my blogging this weekend but my book was too absorbing. Geez, 7 weeks canoeing in the wilderness with a good book. How can you beat that? You can't. I confess to feeling a bit tired and cranky today, so when I saw the book cover, I was put off. Glad I trusted how I always enjoy your posts, because WHITE CAT sounds incredible. I will be recommending it to my 17 year old. I think all writers need to be aware that their characters' voice and thoughts should stay, well, in character. Your observations are a good lesson to us all. All, I got my son off after a last minute shopping trip and now I'm getting my daughter packed to visit grandparents in NYC tomorrow for a week. Soon my husband and I will have a quiet house. Lakeviewer, I’m a more critical reader since I’ve started writing but also more appreciative of good writing like Holly Black's. McElderry Books, an imprint of Simon and Schuster, published White Cat. The hydrangea would have been a copy editing issue and the rest would be something an editor might have flagged. Overall the voice was believable except for a few slips. The author is already a NYT bestseller. Tina, he was happy to go, thanks. ACIL, it’s an odd combination but it works really well. The best books are worth rereading as we mature. Edith, overall Cassel had a convincing teenaged boy voice except for the lyrical slips. I’d actually like those elements to stay; they just need a bit of justification in back story. Pamela, I’m a bigger fan of realism, but I get the appeal of magic for teens. It was nice to see something fresh here. I'm maxed out on vampires. Tricia, good point on the omniscient voice. YA is usually narrated from the teen protagonist’s POV for a more personal connection. Thanks for the Leviathan recommendation. I read a good review in the NYT, but I hadn’t realized it also had boy/girl alternating POV. I should check it out. Bee, I haven’t read Tangerine and will check it out, thanks! Good to hear you enjoyed PREP too. The MC’s voice was very convincing, although I didn’t like her that much. David, I’m envious of my son’s adventure. At the last minute he also packed Exodus by Leon Uris, a book I enjoyed when I was his age. DM, the cover fit the narrative as it is dark and edgy, but it’s also really well written. Let me know what your son thought of it. I’d have passed my copy onto my son except he didn’t want a hardcover during canoe portages. My daughter will read it first although I’m not sure if she’ll like it. Staying in character/voice with a boy narrator is a challenge for me too. White Cat was a fine example of how well it can work (most of the time) and where it can trip (occasionally.) This is something I’ll be checking in revision and test on male readers. My boy narrator is a bookworm and raised in a remote location so there is more justification for lyricism. Alyssa, it was less violent than a grown up novel, and it worked in the narrative. I still thought it would be too much for my 12-year-old daughter to stomach and she agreed. If you don’t like any violence, this book is not for you. You wouldn’t be kept up at night due to being scared, but you might just because the narrative is so gripping. Yes, I really liked Ethan’s voice. The authors of BC recommended White Cat to me/us in the interview. I have to echo that first sentence attention grabber: a cross between Harry Potter and the Sopranos--wow. Enjoyed the video too. Hope your son has fun! :) I'm always impressed when writers cross sexes. Happy Monday! This does sound like a book that would appeal to many young male readers, but no doubt will appeal to many female fantasy lovers, like my granddaughter, as well. I hope your son has a great time on his trip--seven weeks in the wilderness sounds pretty impressive to me! Cynthia, quiet is nice for a change. Keri, it’s a challenge switching back and forth between an English boy voice and an American girl voice, but it’s exactly what my story needed for the full cross-cultural experience. Luckily I have a male Brit in residence to help me translate. Happy Monday to you too! Rose, older teen girls have posted very favorable reviews of White Cat. Isn’t it marvelous that five teen boys have chosen to totally unplug for 7 weeks?